Description: Very early AR use. Description: Third class Barry machine cancel on "junk mail" advertising trips to the Paris expo. Enclosure not present. Description: CSA stampless cover postmarked MANNING, S.C., MAY 27 with manuscript "5 Pd" sent to Mayesville, S.C.. Description: CSA #11 on cover postmarked blue COLUMBIA, S.C., DEC. 5 sent to Yorkville, SC. Description: CSA stampless folded letter postmarked ANDERSON, C.H. S.C., OCT 20 with handstamped PAID no rate sent to Columbia, SC. Description: CSA stampless cover postmarked BRENHAM, TEX., JUL 26 with matching PAID 5 sent to Hockley, Texas. Description: CSA #7 pair on cover postmarked double circle CAMDEN, S.C., FEB 28 sent ot Bivingsville, SC. Description: CSA #11 on cover postmarked BRENHAM, TEXAS, JUN 30 and sent to Travis, Texas. Description: Scott US CSA 4 and 7 pay the standard 10 cent Confederate States of America rate to Richmond, canceled with an Army of Northern Virginia grid. 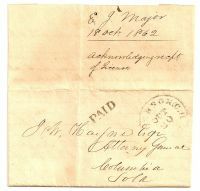 Description: Three Scott US 65 and a 63 pay the pre-1863 10 cent rate from Maine to California. Addressed to the ship "Eastern Star".